Background and Objective: Disk displacement frequently causes dysfunction of the temporomandibular joint (TMJ). Magnetic resonance imaging (MRI) of the TMJ is 95% accurate in the assessment of disk position and form. Various restorative procedures are used for treatment of disk displacement. However, several authors have noted a lack of correlation between MRI findings of disk displacement and the extent of pain and dysfunction of the TMJ. The purpose of this study was to evaluate whether MRI findings of various degrees of disk displacement could be correlated with the presence of clinical signs and symptoms in patients with a clinical disorder of the TMJ. Materials and Methods: One hundred and forty-four TMJs (in 72 patients) were imaged. Displacement of the posterior band in relation to the condyle was quantified as mild or significant. Results: Disk displacement was found in 45 (54%) of the 84 symptomatic joints and 13 (22%) of the 60 asymptomatic joints. Among the 84 symptomatic joints, 31 (37%) had disk displacement with reduction and 14 (17%) had disk displacement without reduction. In the latter group, 11 (79%) of the 14 joints had significant displacement of the posterior band (8 or 9 o'clock) and 21% had mild displacement of the posterior band (10 o'clock). Of the 60 clinically asymptomatic joints, 47 (78%) had no signs of disk displacement on MRI, whereas 13 (22%) had disk displacement with reduction. None of the asymptomatic joints had disk displacement without reduction. The difference in occurrence of disk displacement between symptomatic and asymptomatic joints was statistically significant (54% vs. 22%; p < 0.001). However, the difference in occurrence of disk displacement with reduction of the disk on mouth opening was not statistically significant (37% vs. 22%; p = 0.06). Conclusions: Disk displacement on MRI correlated well with clinical symptoms in cases of significant disk displacement and in cases of disk displacement without reduction. When disk displacement with reduction was mild, there was no statistically significant difference between symptomatic and asymptomatic joints, which suggests that other causes should be considered. However, several authors have noted a lack of correlation between MRI findings of disk displacement and the extent of pain and dysfunction of the TMJ in patients with painful limitation of mandibular opening.8,9 Moreover, disk displacement was found in a substantial number of asymptomatic volunteers.9-12 For example, Tasaki and colleagues13 reported a 21% prevalence of internal derangement on MRI evaluation of 57 asymptomatic people. The purpose of this study was to evaluate whether MRI findings of various degrees of displacement of the TMJ meniscus were correlated with the presence of clinical signs and symptoms of pain in patients with a clinical disorder of the TMJ. One hundred and forty-four TMJs were imaged between May 1999 and September 2006. The study population consisted of 72 patients (23–91 years of age, mean 58 years), with both TMJs being imaged in each patient. The MRI examinations were performed on a 16-channel, 1.5-T imaging system (Signa Excite, GE Healthcare, Milwaukee, WI). A dedicated TMJ coil was used for both the open- and closed-mouth positions. Each set of images was read by 1 of 3 musculoskeletal radiologists (with 4, 2 and 2 years of experience in musculoskeletal radiology, respectively). The TMJ examination consisted of sagittal and oblique T2-weighted (5150 ms repetition time, 91 ms echo time) fast spin-echo images. The morphology and position of the disk with the mouth closed was recorded. The position of the meniscus was deemed normal if the posterior band was located at the 12 o'clock position in relation to the condyle. Joints with internal derangement consisting of anterior displacement of the meniscus were divided into groups according to the location of the posterior band of the meniscus in relation to the condyle. Mild disk displacement was defined as the posterior band being between 10 and 11 o'clock relative to the condyle. Significant disk displacement was diagnosed when the posterior band was located between 8 and 9 o'clock. In cases of anterior displacement of the meniscus, the presence or absence of disk reduction when the mouth was opened was also determined (Fig. 1). Figure 1a: Anterior displacement of the articular meniscus in relation to the mandibular condyle in closed-mouth position. Figure 1b: The displaced disk does not reduce when the mouth is opened, and opening of the mouth was restricted in this patient. The clinical symptoms described in the referring letter were recorded. The presence and type of internal derangement were correlated with the clinical presentation. Eighty-four of the joints were clinically symptomatic. Disk displacement was found in 45 (54%) of these symptomatic joints, including 31 (37%) with reduction (Table 1). Of these 31 joints, 30 (97) had mild displacement of the posterior band (10 or 11 o'clock) in relation to the mandibular condyle, and 1 (3%) had significant displacement (9 o'clock). Fourteen (17%) of the symptomatic joints had anterior displacement without reduction. Of this group 11 (79%) had significant displacement of the posterior band (8 or 9 o'clock) in relation to the mandibular condyle, and 3 (21%) had mild displacement (10 o'clock). Thirty-nine (46%) of the symptomatic joints had no signs of disk displacement. For 10 (26%) of these 39 joints, the contralateral TMJ in the same patient had disk displacement. Sixty of the joints were clinically asymptomatic. Forty-seven (78%) of these joints had no signs of disk displacement on MRI, whereas 13 (22%) had anterior displacement of the articular meniscus with reduction. All of these joints had mild displacement of the posterior band (10 or 11 o'clock) in relation to the mandibular condyle. 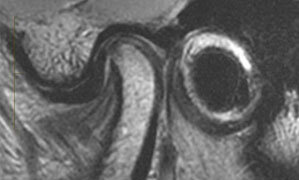 None of the asymptomatic joints had anterior disk displacement without reduction. The difference in occurrence of disk displacement between symptomatic and asymptomatic joints was statistically significant (54% vs. 22%; χ2 = 14.81, degrees of freedom [DF] = 1, p < 0.001). However, the difference in occurrence of disk displacement with reduction of the disk when the mouth was opened was not statistically significant between symptomatic and asymptomatic joints (37% vs. 22%; χ2 = 3.29, DF = 1, p = 0.06). Internal derangement has been considered an underlying mechanism in the pathogenesis of TMJ dysfunction associated with clinical symptoms such as pain, joint sounds and abnormal jaw function and a main factor in the development of secondary osteoarthritis. Failure of nonsurgical therapies accompanied by persistently high levels of pain and dysfunction that interfere with the activities of daily living are the primary indications for surgical intervention.14,15 The concept of internal derangement was the basis for the development of invasive procedures designed to reposition the displaced disk, but these have been associated with numerous surgical failures and development of osteoarthritis.15 Therapeutic procedures such as arthrocentesis, arthroscopic lysis and lavage, and arthrotomy are used to reduce TMJ loading and to restore normal TMJ function and structure.5 TMJ arthroscopy has increased in popularity because it is less invasive than open surgery, is associated with few complications and requires a shorter hospital stay. The clinical significance of imaging findings of internal derangement is controversial. The prevalence of displacement of the TMJ disk among asymptomatic volunteers was previously reported as nearly 33%,9-13 and the prevalence of normal articular disk in symptomatic joints was reported to be 16%–23%.11 Moreover, arthroscopy and MRI have shown that TMJs with anteriorly displaced disks have the capacity to form remodelled retrodiscal tissue that resembles cartilage16 (i.e., pseudo-disk formation). Furthermore, the retrodiscal tissues have adaptive capacity and often respond appropriately to the functional loads placed on the tissues. Disk displacement in asymptomatic TMJs was always mild, whereas patients with TMJ pain and dysfunction more often had significant disk displacement. Mild (10 or 11 o'clock) displacement of the disk in relation to the mandibular condyle was observed in 39% of symptomatic and 22% of asymptomatic joints. There was no statistically significant difference in occurrence of disk displacement with reduction of the disk on mouth opening between symptomatic and asymptomatic joints (p = 0.06). In this study, all of the joints that had significant displacement of the posterior band of the articular meniscus in relation to the mandibular condyle (with or without reduction of the displaced disk on mouth opening) were symptomatic. Almost all of the disks with significant displacement did not reduce when the patient opened his or her mouth, which suggests that the severity of displacement correlated well with the presence of disk reduction during mouth opening and therefore with the presence of symptoms. This study had several limitations. First, it was a retrospective study, in which the MRI findings were correlated with the clinical data mentioned in the referral requisition, such as pain and clicks in the symptomatic joints. These clinical symptoms are part of the wide spectrum of TMJ myofascial pain syndromes, which may explain why 39 (46%) of the 84 symptomatic joints had no disk pathology. This aspect is important in evaluating the correlation of MRI findings with symptoms related to internal derangement of the TMJ. Another limitation is that we assessed only findings of internal derangement in the TMJ; we did not evaluate other findings of articular pathology that might have explained symptoms in joints that lacked internal derangement. However, this focused assessment was in keeping with the objective to focus on the correlation between clinical findings and disk displacement. In addition, there was no control group of asymptomatic subjects. However, MRI evaluation of asymptomatic TMJs has been described in detail in the literature,9-13 and we compared our results with the published data. A prospective controlled study will be required for more detailed evaluation of the correlation between MRI findings and clinical symptoms. Disk displacement as observed with MRI correlated well with clinical symptoms in cases of significant displacement of the posterior band in relation to the mandibular condyle and in cases without reduction of the anteriorly displaced articular disk when the mouth was opened. When disk displacement with reduction was mild, there was no statistically significant difference between symptomatic and asymptomatic joints, which suggests that other causes should be considered. Dr. Maizlin is a staff radiologist in the department of radiology, McMaster University Medical Centre, Hamilton, Ontario. Dr. Nutiu is a radiology resident in the department of radiology, McMaster University Medical Centre, Hamilton, Ontario. Dr. Dent is a staff pediatric rheumatologist at McMaster University Medical Centre, Hamilton, Ontario. Dr. Vos it a staff radiologist in the department of radiology, St. Paul's Hospital, Vancouver, British Columbia. Dr. Fenton is a staff radiologist in the department of radiology, St. Paul's Hospital, Vancouver, British Columbia. Dr. Kirby is a staff radiologist in the department of radiology, McMaster University Medical Centre, Hamilton, Ontario. Dr. Vora is a staff radiologist in the department of radiology, McMaster University Medical Centre, Hamilton, Ontario. Dr. Gillies is a staff rheumatologist in the division of rheumatology, University of British Columbia, Vancouver, British Columbia. Dr. Clement is a staff radiologist in the department of radiology, St. Paul's Hospital, Vancouver, British Columbia. Acknowledgements: The authors wish to thank Ms. Mary Lou Schmuck and Dr. Geoff Norman for their help with the statistical analysis of the study. Correspondence to: Dr. Zeev V. Maizlin, Department of radiology, McMaster University Medical Centre, 1200 Main St. West, Hamilton, ON L8N 3Z5. Guralnick W, Kaban LB, Merrill RG. Temporomandibular-joint afflictions. N Engl J Med. 1978;299(3):123-9. Solberg WK, Woo MW, Houston JB. Prevalence of mandibular dysfunction in young adults. J Am Dent Assoc. 1979;98(1):25-34. Farrar WB. Letter: Myofascial pain dysfunction syndrome. J Am Dent Assoc. 1975;91(2):205-6. Dolwick MF, Katzberg RW, Helms CA. Internal derangements of the temporomandibular joint: fact or fiction? J Prosthet Dent. 1983(3);49:415-8. Sidebottom AJ. Current thinking in temporomandibular joint management. Br J Oral Maxillofac Surg. 2009;47(2):91-4. Epub 2009 Jan 19. DaSilva AF, Shaefer J, Keith DA. The temporomandibular joint: clinical and surgical aspects. Neuroimaging Clin N Am. 2003;13(3):573-82. Tasaki MM, Westesson PL, Raubertas RF. Observer variation in interpretation of magnetic resonance images of the temporomandibular joint. Oral Surg Oral Med Oral Pathol. 1993;76(2):231-4. Hansson LG, Hansson T, Petersson A. A comparison between clinical and radiologic findings in 259 temporomandibular joint patients. J Prosthet Dent. 1983;50(1):89-94. Kircos LT, Ortendahl DA, Mark AS, Arakawa MS. Magnetic resonance imaging of the TMJ disc in asymptomatic volunteers. J Oral Maxillofac Surg. 1987;45(10):852-4. Larheim TA. Role of magnetic resonance imaging in the clinical diagnosis of the temporomandibular joint. Cells Tissues Organs. 2005;180(1):6-21. Katzberg RW, Westesson PL, Tallents RH, Drake CM. Anatomic disorders of the temporomandibular joint disc in asymptomatic subjects. J Oral Maxillofac Surg. 1996;54(2):147-53. Ribeiro RF, Tallents RH, Katzberg RW, Murphy WC, Moss ME, Magalhaes AC, et al. The prevalence of disc displacement in symptomatic and asymptomatic volunteers aged 6 to 25 years. J Orofac Pain. 1997;11(1):37-47. Tasaki MM, Westesson PL, Isberg AM, Ren YF, Tallents RH. Classification and prevalence of temporomandibular joint disk displacement in patients and symptom-free volunteers. Am J Orthod Dentofacial Orthop. 1996;109(3):249-62. Trumpy IG, Lyberg T. Surgical treatment of internal derangement of the temporomandibular joint: long-term evaluation of three techniques. J Oral Maxillofac Surg. 1995;53(7):740-6. Israel HA. Are internal derangement and osteoarthrosis linked to changes in clinical outcome measures of arthrocentesis of the temporomandibular joint? J Oral Maxillofac Surg. 2003;61(10):1167-70. Barkin S, Weinberg S. Internal derangements of the temporomandibular joint: the role of arthroscopic surgery and arthrocentesis. J Can Dent Assoc. 2000;66(4):199-203. Emshoff R, Brandlmaier I, Gerhard S, Strobl H, Bertram S, Rudisch A. Magnetic resonance imaging predictors of temporomandibular joint pain. J Am Dent Assoc. 2003;134(6):705-14. Westesson PL, Brooks SL. Temporomandibular joint: relationship between MR evidence of effusion and the presence of pain and disk displacement. AJR Am J Roentgenol. 1992;159(3):559-63. Yang X, Pernu H, Pyhtinen J, Tiilikainen PA, Oikarinen KS, Rausti AM. MR abnormalities of the lateral pterygoid muscle in patients with nonreducing disk displacement of the TMJ. Cranio. 2002;20(3):209-21.